Almost Die in a Hawaiian Lava Flow? Check. A lava delta in Hawaii Volcanoes National Park collapsed into the ocean on New Year's Eve, sending 22 acres of molten rock, steam, and debris crashing into the water, and giving some onlookers a close brush with death. The Big Island lava flow where this occurred is called the Kamokuna ocean entry, and it is now closed to visitors. The park is set to open a new entry Tuesday. "Those 40-foot waves that were generated from the breakoff started to erode the coastal cliff section, so a lot of the coast cliff area that was out there, the former viewing area, all of that fell into the ocean," Jessica Ferracane, the national park's spokesperson, told the Associated Press. "It's a very, very dangerous situation out there." The dramatic collapse began around 2:45pm and continued over the next several hours, sending a billowing cloud of smoke over the shoreline, thunderous booming, and flashes of red as lava fell into the ocean. Around 7pm park rangers had to chase down five visitors who ignored official warnings and tried to get a closer look. Just 15 minutes after they returned to the designated safe zone, the cliff they were standing on crashed into the ocean. "It was a really close brush with death for them," said Ranger Travis Delimont, one of the two who chased them down. "Luckily, they finally listened to us and turned around in time." Officials have said that the new land created in a lava flow like the ones at Kamokuna look "deceptively stable" -- which is why this has been an ongoing safety concern for months as crowds flock to gaze at the molten rock. The land beneath the delta is all rubble. 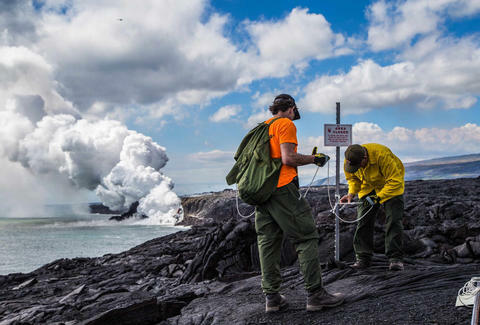 As early as last October, USGS Hawaiian Volcano Observatory scientists had pointed out cracks running parallel to the coastline. "We work very closely with USGS," Ferracane told Thrillist. For the new viewing area, they have taken steps to ensure that all safe zones are plotted well behind any cracks in the cliff. She also noted that because the lava flows are changing constantly, the rangers will move the safe zones on a case by case basis as needed. "Had anyone been close by on land, water or air, lives would have surely been lost," said Park Superintendent Cindy Orlando. Check out the video and photos below to see what it looks like when the earth crumbles beneath you, and be thankful you have yet to boil alive and dissolve completely.